Omaha, NE: At its August 10th meeting, the Papio-Missouri River Natural Resources District Board of Directors heard public comments and then voted to propose a Fiscal Year 2018 general operating budget that will, once again, require no increase in the NRD property tax levy. “The District’s property tax levy will remain the same as last year,” said NRD General Manager, John Winkler. “This is 12 out of 13 years the District has either decreased or kept the tax levy the same. We work extremely hard to leverage federal and state cost sharing on projects to save local taxpayers millions of dollars,” said Winkler. In addition, Winkler said the FY 2018 proposed budget is $1.5 million less than last year and the District is able to maintain a responsible budget and healthy financial position despite increases in costs like permitting, insurance, wages, materials and land costs. The proposed budget calls for a FY 2018 property tax levy of .038034 per $100 of assessed valuation. This means that a homeowner with property valued at $100,000 would pay a total of $38.03 in property taxes next year to support NRD projects.The budget calls for an estimated $23 million in revenue from the NRD’s property tax levy. Total spending is estimated at just under $69 million. The Papio-Missouri River NRD’s property tax levy amounts to less than two percent of the total property tax bill for residents living within the District’s six-county area.The levy is based on an estimated 3.5 percent increase in valuations across the district, which includes all of Sarpy, Douglas, Washington and Dakota counties, plus the eastern 60% of Burt and Thurston counties. The NRD Board of Directors will hold a public hearing, approve a final budget and set the tax levy at its September 14th board meeting in Dakota City. Free scrap tire collection! 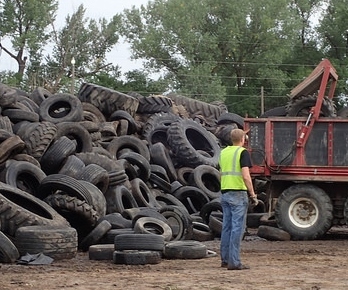 The Lower Elkhorn NRD, Papio-Missouri River NRD, and Nebraska Loess Hills RC&D Council will have a free scrap tire collection on Friday, August 24, 2018, from 8:00 a.m. to 12:00 p.m. (noon) at the Cuming County Fairgrounds in West Point, NE. This collection will accept all sizes of car, truck, semi and tractor tires. Each load is limited to 100 tires. No rims will be accepted so ALL tires must be off rim. Tires cannot be accepted from any business which charges a tire disposal fee. Do not leave vehicles unattended in line. Limited unloading help will be available, so plan to unload your own. The collection ends at noon, and the gates will be locked at that time, so be sure to arrive before 12:00 p.m. (noon). The 10 county collection area includes Burt, Colfax, Cuming, Dakota, Dodge, Douglas, Sarpy, Stanton, Thurston, and Washington counties. Residents and businesses which do not charge tire disposal fees can dispose of tires at this collection. Vehicles must use Mill Street to access the fairgrounds. From Hwy 275 turn west on 13th Street then head south on Mill Street. Loads with less than 20 tires are encouraged to arrive during the last 90 minutes of the collection for a shorter wait time. Champlin Tire Recycling will process tires collected during the event. This processing includes repair and retread of salvageable casings, reclamation of tires meeting used tire specifications and the production of park benches, picnic tables, and feed bunks. Funding for this free collection is provided through a grant from the Nebraska Department of Environmental Quality. For more information please contact Deborah Ward at the Papio-Missouri River NRD (402)374-1920 ex. 3. © 2019 Papio NRD All rights reserved.